Sharon Lee and Moninca Rawlings are hosting a series of bigfoot expeditions. 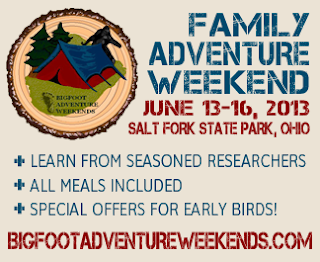 The first is to be held June 13 - 16 at the legendary Salt Fork State Park in eastern Ohio. Having bigfooted there before, I can attest that it is an excellent area to seek the big guys. For four days and three nights, you can experience the thrill of a lifetime searching for the elusive creature known as Bigfoot. Join seasoned researchers as they take you on an expedition, learn from seminars and hands on training, as well as actual night investigations, to help you along the road of Bigfoot research. I am a big proponent of attending public expeditions because you get to learn from experienced researchers, and you can network with others who share this same unusual interest. The people you meet make bigfooting even more rewarding. 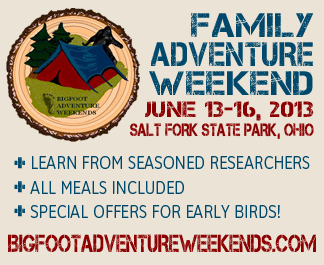 You can register for a Bigfoot Adventure Weekend for a very reasonable price by clicking this link. I absolutely love these women and what they do.... I look forward to joining them one day soon.